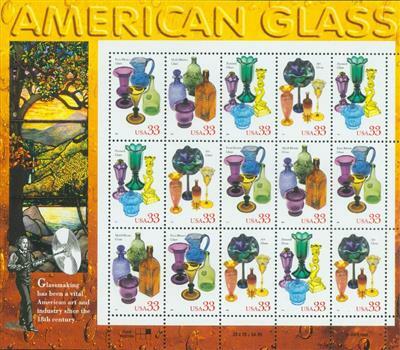 US #3749 from the American Design series. 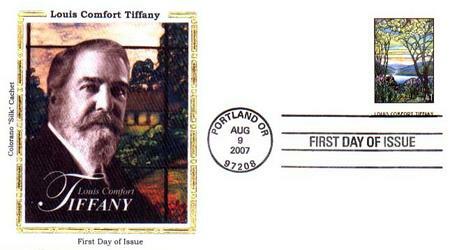 Louis Comfort Tiffany was born on February 18, 1848, in New York City, New York. 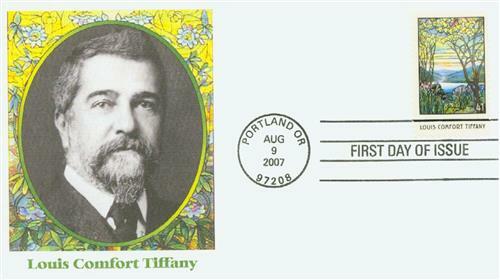 Tiffany was born to wealthy Charles Lewis Tiffany, owner of Tiffany & Co. jewelry store in Manhattan. Tiffany attended military academies before beginning training as a painter. He studied under George Inness and Samuel Colman and attended the National Academy of Design in New York City before traveling to France. US #4165 pictures the Tiffany Studios Magnolias and Irises, designed around 1908. Tiffany first became interested in glass while he was an art student in France around 1875. He returned to the US and worked in several glasshouses before forming a company with fellow artists. They designed wallpaper, furniture, and textiles. That business only operated for four years, after which Tiffany formed his own glassmaking factory. Tiffany continued to do interior work, providing the interior design for the Mark Twain House in Hartford, Connecticut, in 1881. But his most notable design project came the following year. When Chester A. Arthur was elected president, he had been used to living in luxury and found the White House looked like “a badly kept barracks” and refused to move in. He then hired the best interior designer of the day, Louis Comfort Tiffany. Besides repainting and changing the wallpaper, Tiffany created a 55-foot glass screen to block drafts in the Entry Hall. The stained glass featured eagles and flags to coordinate with the existing artwork on the walls. Decorative glass fixtures and windows also highlighted Tiffany’s talent, for which he would later become famous. Arthur also had new plumbing, a bathroom, and an elevator installed. US #3749 – Silk Cachet First Day Cover. Then in 1885, Tiffany established his own glassmaking firm named Tiffany Studios. Tiffany sought to improve the coloration of the medieval glass he had admired in London, and developed a glassmaking process he named “favrile.” Tiffany made his favrile iridescent glass by mixing different colors of glass together while hot. US #3749 – Fleetwood First Day Cover. The technique allowed the glass to transmit more texture and richer colors than the traditional method of stained glass, in which colorless glass was painted in glass paint or enamels. 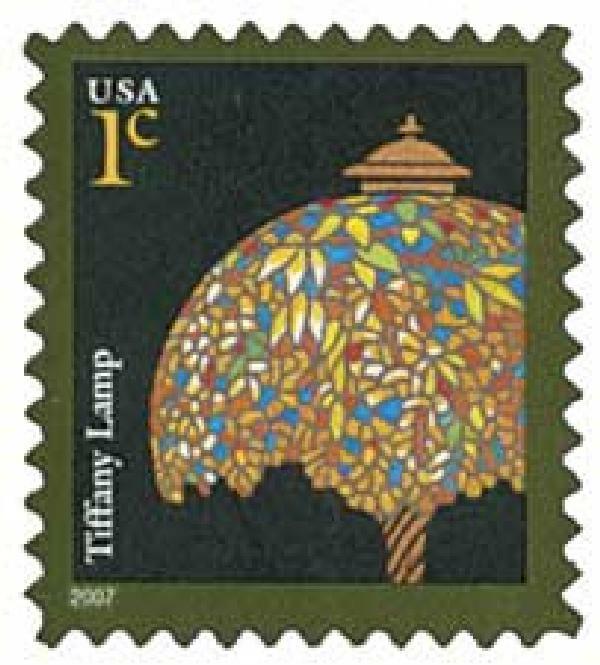 Tiffany incorporated a number of unusual techniques in his works, including patterns of glass strings affixed to a sheet of glass (streamer glass), irregularly shaped thin glass wafers resembling leaves (fracture glass), and drapery glass. US #4165 – Fleetwood First Day Cover. First exhibited at the 1893 Chicago World’s Fair, the Tiffany lamps were instantly recognized for their artistic beauty and form. To create these handmade works of art, Tiffany employed hundreds of artisans at Tiffany Studios. The artisans either carried out Tiffany’s designs or created designs under his guidance. US #4165 – Silk Cachet First Day Cover. 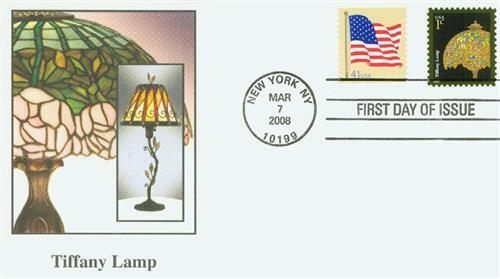 The shade of every lamp began with an artist’s drawing. Artisans then spent up to a week choosing and cutting hundreds of pieces of glass for the complex design of each shade. Leading held the leaves, flowers, and other natural shapes together. 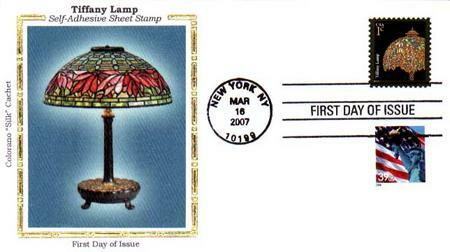 Considered luxury items, Tiffany lamps sold at premium prices and are still prized today. Over the length of his career, which lasted more than 50 years, Louis Tiffany designed jewelry, stained glass lamps, and windows. He also served as the first Design Director for Tiffany and Co. Tiffany died on January 17, 1933. 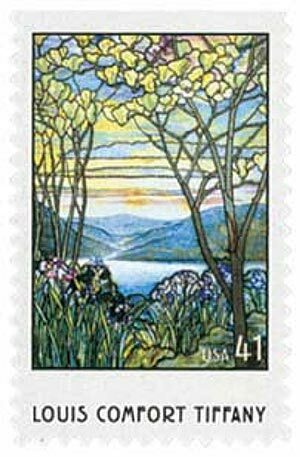 US #3325-28 – The selvage of this sheet pictures a Tiffany landscape window from the Corning Glass collection. Today, the largest exhibition of Tiffany’s works can be found at the Charles Hosmer Morse Museum of American Art in Winter Park, Florida. The exhibit includes Louis Tiffany designed jewelry, stained-glass windows and lamps, paintings and even the interior of a chapel he designed for the 1893 World Columbian Exposition, held in Chicago, Illinois. But his works can also be seen at the Fine Arts Museum, San Francisco, the Louvre in Paris, the Metropolitan Museum of Art in New York, and the British Museum in London, just to name a few. Click here to view some of Tiffany’s paintings and here to view some of his glassworks. 4 Responses to "This Day in History… February 18, 1848"
Where is the “Tiffany created a 55-foot glass screen to block drafts in the Entry Hall. The stained glass featured eagles and flags to coordinate with the existing artwork on the walls” is it in the White House still?? I wondered as well…I’d like to see a rendering. Thank you for reminding or informing. A good point of interest that adds life to our history.